﻿The American Flag, more than a symbol of enduring freedom, Government and ideology. The 50 stars in the 'Union' represent all 50 States. 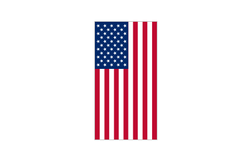 However, the thirteen alternating red and white stripes represent the original thirteen Colonies that turned against the British Crown, becoming the first states in the Union. 2. Display the American flag properly when hung in a window or draped as decoration with the stars at the upper left, as viewed from the public's standpoint. When Draped over a Coffin, the field of stars belong at the head over the left shoulder. Remove the flag and properly fold it before lowering the Coffin into the ground. 3. Display in reverse on the right hand shoulder of a uniform to symbolize blowing in the wind. Wear the American Flag logo as a lapel pin on the left breast over the heart or as a tie clip, although deemed inappropriate and disrespectful to wear it as a clothing item. This confuses many people, considering 'Uncle Sam' has always worn a number of clothing items made to represent the Flag. 4. Illuminate the American flag if left out at night. You can leave the flag out in bad weather. Considered an act of disrespect to allow the flag to touch the ground. Also considered an act of disrespect to burn the American flag in protest. 5. Display the American flag proudly. More days than you may know have been designated as "patriotic holidays." These include the obvious line up: Patriots Day, April 19; Flag Day, June 14; Independence Day, July 4th and Veterans Day, November 11th. For a more detailed list, visit https://www.usflag.org/flagholidays.html. * When it comes time to dispose of a worn out flag, contact your local VFW Chapter, Elks Lodge, American Legion, or the Knights of Columbus to perform the proper ceremony. A small donation is always encouraged. * 'Retired' Flags made of cotton or wool should be ceremoniously burned, out of respect. * Flags made of Nylon or other synthetic material may release toxic fumes into the air, in violation of many State's Laws. They should be buried instead.